The inevitable distance that has separated the Indian cricket fan from the playing fields of England has shrunk dramatically over the decades, as technology has overcome geography. Detailed match reports were once available in newspapers only the next day. The subsequent radio age allowed the diehards to tune in to John Arlott and his merry band from the Test Match Special, despite the mad hiss of short-wave broadcasts. The coming of satellite television brought international cricket into our living rooms. ESPNcricinfo allowed fans to follow the game on their computers at work. Wider prosperity after the economic reforms allowed more of us to actually be at an English cricket ground to cheer our team, with the mandatory pint of Guinness at hand. In July, Virat Kohli will lead the 18th Indian Test team to visit England. Here is a list of the high points, low points and turning points over the past 86 years in a Test match featuring India in England. The first Indian Test team led by C.K. Nayudu took the field with few expectations. Yet, it had the powerful English team in trouble in no time. The hosts opened their innings with the formidable Yorkshire pair of Percy Holmes and Herbert Sutcliffe. The two had been involved in a record opening stand of 555 against Essex a few days earlier, and urban legend has it that the famous cigarette brand State Express 555 was named after their deed. Anyway, both batsmen were castled by fast bowler Mohammad Nissar before they could reach double figures. Then Lal Singh ran out the stylish Frank Woolley. England were three down for just 19 and were eventually bowled out in 4 hours for a score of 259. The visitors were definitely on top at the end of the first day. As the Wisden Cricketers’ Almanack said: “As India in a poor light made 30 runs without loss at the end of the day—play being stopped for a quarter of an hour and finally ending at six o’clock—the visitors may be said to have had the best of matters." England were once again 67 for four in the second innings, and though the Indians subsequently let the match slip out of their grasp, there is no doubt that the babies gave the big boys a run for their money. England had comfortably won the first Test at Lord’s. The second Test at Old Trafford did not begin well for the visitors. The Indians were bowled out for 203 in the first innings. England were already 173 for two at the end of the first day, with Wally Hammond batting on 118. They finally declared at a monumental 571 for eight. An innings defeat stared in the face when Vijay Merchant and Mushtaq Ali walked out to open the Indian innings for a second time. They were a study in contrast—the clinical Merchant versus the dashing Ali. They batted through most of the day, and went back to the pavilion with the Indian score at 190 for no loss. The duo was eventually separated the next day when the score was 203—by poetic coincidence, the same score that the entire team managed in the first innings. Both the openers scored centuries. C. Ramaswami (60), C.K. Nayudu (34) and Amar Singh (48 not out) battled on to save a match that was almost lost. The cricket writer Neville Cardus wrote: “Mushtaq Ali made 112, and his cricket touched the imagination; there was suppleness and lithe grace which concealed power, as silkiness of skin conceals the voracity of strength in a beautiful animal of the jungle." About Merchant, he wrote: “Merchant is, in method, the Indians’ good European. He could easily be England’s opening batsman. He is a thoroughly organised player. He thinks out his strokes, does not perform them by instinct." The first Test of this tour exposed the traditional Indian weakness against the moving ball. Fred Trueman and Alec Bedser scythed through the Indian top order in the second innings of this game. Pankaj Roy, D.K. Gaekwad, Madhav Mantri and Vijay Manjrekar were back for ducks. Polly Umrigar departed when the score was 26. It was left to captain Vijay Hazare and all-rounder Dattu Phadkar to regain some respectability. They scored 120 of the team’s 165 runs. Hazare had scored 89 in the first innings as well, with Manjrekar hitting a classy 133, in a team score of 293. England won the Test easily. The shock forced the Indian selectors to famously recall Vinoo Mankad, who was then playing league cricket in England as a professional. The next Test at Lord’s is now known as Mankad’s Test: He scored 72 and 184 in the two Indian innings, and also took five wickets for 196 runs in the English first innings. Yet, England won by eight wickets. The third Test was a disaster. India were bowled out for 58 in the first innings and 82 in the second, with only Hazare, Manjrekar and Hemu Adhikari putting up a semblance of a fight. It was how the traditional script then read—a handful of brave individual efforts amid a disastrous team performance. The 1959 tour was a washout, as the Indian team led by D.K. Gaekwad lost all five Tests. The 1967 tour was no better in terms of the final result. India lost all three Tests. But not before a few glimpses of what was possible in the future. In the first Test, England piled up 550 runs for four, before declaring the first innings. Geoff Boycott crawled to his highest international score of 246, and was dropped for the next Test for doing so. Nine Indian players bowled in a desperate attempt to get a breakthrough. India followed on after being bowled out for 164 in the first innings. A historic fightback followed. Farokh Engineer (87), Ajit Wadekar (91), Chandu Borde (33) and Hanumant Singh (73) rose to the occasion—a rare example when most of the Indian batting line-up clicked. Even Erapalli Prasanna and Bishan Singh Bedi held their ground. But the star of the show was undoubtedly the captain, Mansur Ali Khan Pataudi, who led from the front as usual. He followed his 64 in the first innings with a majestic 148. A few months later, Pataudi would hit 75 and 85 against the Australian fast bowlers on a Melbourne green top, with one damaged eye and one injured foot. Wisden named him one of its five cricketers of the year. The batting display at Headingley in 1967 could be seen as an introduction to the later successes in international cricket. Ajit Wadekar had just led India to a series win in the West Indies, with a young opening batsman named Sunil Gavaskar scoring 774 runs in four Tests. The other star of that tour was Dilip Sardesai. But it was one thing to beat a depleted West Indies and another thing to face an English team that had just won the Ashes in Australia. The first two Tests were evenly matched. England took a sizeable first innings lead in the third Test, and the match seemed headed for a third successive draw when Brian Luckhurst and John Jameson walked out to begin the second innings. Then B.S. Chandrasekhar struck. He took six wickets for 38 runs, as the English batsmen could not make sense of the wrist spinner. However, the image that has stuck in public memory is the wicket of Alan Knott, the English wicketkeeper who had been a thorn in the side of the Indian spinners. Eknath Solkar leapt at short leg as if his life depended on it, to get his hands under the ball just before it could touch the ground. That wicket was as much his as S. Venkataraghavan’s. England were bowled out for 101 runs in 45.1 overs. However, the run chase was not a smooth one. The openers went early. Wadekar had things under control till he was run out. But Farokh Engineer kept his cool, and was at the other end when S. Abid Ali hit that square cut to take India to its first Test win in England, after a wait of nearly four decades. India were literally on top of the cricketing world. India arrived in England in the summer of 1974 as one of the strongest teams in international cricket. That reputation was to be left in tatters by the end of the tour. It was bitterly cold in England that year, perfect conditions for swing bowlers. England won the first Test at Old Trafford comfortably, despite a brilliant century by Sunil Gavaskar. The weather improved for the second Test. Lord’s was bathed in sunshine as England piled up 629 runs. India began well, but eventually fell short at 302 all out. The weather changed on the fourth day, and the sun went behind a cloud cover. The very first over from Geoff Arnold was a warning. Two massive outswingers, followed by a sharp one that came in to trap Farokh Engineer leg before wicket. The Indian batting line-up was demolished in a little more than an hour—just 17 overs—as the new ball began to move dangerously off the pitch. All England needed was one opening spell by Chris Old and Arnold. Mike Hendrick bowled just one over. Arnold would later say: “The ball didn’t do as much in the air as everybody thought, but it certainly went off the pitch; Obviously, what happened was that it had sweated under the covers overnight and greened up just enough to give the ball the sort of purchase I needed. It was amazing really, just one of those days." Only Eknath Solkar put up a fight, remaining unbeaten at 18. India lost all three Tests, and Ajit Wadekar, the most successful Indian Test captain till then, and a graceful batsman, retired from Test cricket after he was unfairly targeted. The final Test at The Oval came after an indifferent tour for the Indians. The first was lost, the second was saved owing to timely rain and the third was a draw. The Indian team seemed to have saved the best for the last day of the tour. 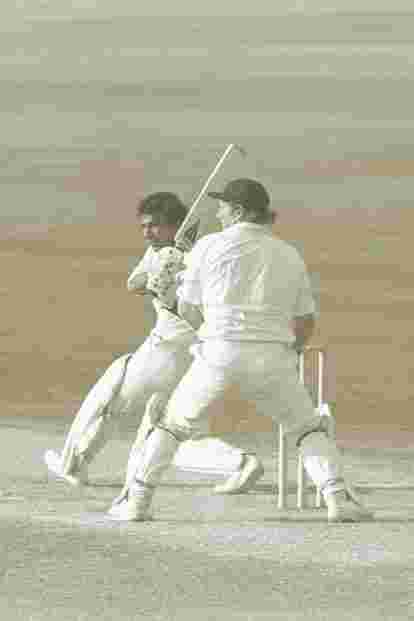 Sunil Gavaskar played an unforgettable innings in one of the greatest run chases in a Test match. Mike Brearley had sent India a target of 438 runs in 500 minutes—a seemingly simple scoring rate in these times but almost unheard of then. India had crossed 300 just once in the previous three Tests in the series. Gavaskar took charge from the beginning, with Chetan Chauhan and Dilip Vengsarkar playing supporting roles. His opening stand with Chauhan was 213 runs, 10 more than what Vijay Merchant and Mushtaq Ali had scored at Old Trafford in 1936. He began slowly, but accelerated as the target came within reach. He scored 221, and was the fourth Indian batsman to get out. The score was 389—just 51 to get with six wickets in hand. What happened next will always be a matter of debate, as the later Indian batsmen lost their nerve but also fell prey to some dodgy umpiring. India were eventually left stranded at 429 for eight wickets, just nine runs short. Gavaskar was then at the peak of his powers—and undoubtedly one of the greatest Test batsmen ever. Never have India dominated a Test series in England as they did in 1986. They came close to winning all three Tests, but the third Test was eventually drawn. They comfortably won the first Test at Lord’s by five wickets. Dilip Vengsarkar set up the win with this third consecutive century at Lord’s. He had done so earlier in 1979 and 1982. Kapil Dev gave a masterly display of swing bowling. But it was the win in the second Test at Headingley that was special, because India beat England on a seaming wicket on which earlier generations of Indian batting line-ups had collapsed in a sorry heap. Vengsarkar gave another masterly performance. He scored 61 in the first innings and an unbeaten 102 in the second. The next best score in the second innings was a typically brisk 31 by Kapil Dev. Otherwise, it was Vengsarkar all the way, as he scored what is recognized by connoisseurs as one of the best centuries in difficult conditions. Roger Binny and Madan Lal ran through the English first innings and Maninder Singh ran through the English lower order in the second innings. The hosts could manage only 102 in the first innings and 128 in the second. The third Test of the 1996 tour of England was drawn. It was important because three of the four batsmen who made up the greatest Indian middle order ever—Sachin Tendulkar, Rahul Dravid, Sourav Ganguly—tuned in together. V.V.S. Laxman would join them a little later. Indian cricket would never be the same again, and more so when the Fab Four were preceded at the wicket by Virender Sehwag and Gautam Gambhir, with M.S. Dhoni coming in at No.7. In 1996, Tendulkar had already made his mark in international cricket. His position in the list of greats was almost secure. Dravid and Ganguly had made their debuts in the previous Test match at Lord’s. Ganguly scored a century on debut. Dravid was unlucky to miss it by just five runs. In the first Indian innings, a rampaging Tendulkar and Ganguly scored 255 runs for the third wicket. Both scored centuries. Dravid came later down the order, at No.7, to get a classy 84. True, it was an easy wicket for batsmen. This innings was akin to a passing of the mantle to the next generation. The trio would later set up an innings victory at Headingley in 2002, with Dravid scoring 148, Tendulkar, 193 and Ganguly, 128. India had held their own in England ever since the 1974 shipwreck. But they lost seven out of nine Tests played over the last two tours, in 2011 and 2014. They had become a champion side in the first decade of the new century, with Sourav Ganguly emerging as an inspired captain. The old fear of playing abroad subsided. Then came the 2011 tour. The Indian team was swept aside, as England won all four Tests. It was almost back to square one as far as playing in England was concerned, bringing back terrible memories of the 1959 and 1967 tours. The old guard was on its last legs. V.V.S.Laxman had an eminently forgettable tour. Sachin Tendulkar had only a few good knocks. Ganguly had retired. Only Rahul Dravid stood bravely amid the ruins, averaging 74.43, with three centuries, though his career would also take a nosedive soon. The new generation has yet to prove itself in English conditions—Suresh Raina had a terrible tour in 2011 while Cheteshwar Pujara would rather forget the 2014 tour. Virat Kohli has yet to make his mark in England. The technically strong Murali Vijay and Ajinkya Rahane have done better than most of their team. A lot is thus riding on the tour that begins Tuesday.